Hey Harriet, chuck a chip our way would you, sweetie? I just had to share this wonderful photograph with you!! It is from Tracy at Hey Harriet, who describes herself as being obsessed by photography. Well if that means doing a brilliant job of taking and presenting photos then I would certainly agree! I was looking at one of my favourite blogs, tractorgirl, where Julie shares, as she puts it "the beautiful things that connect people". Julie is a maker of lovely home wares and accessories herself, and a Mum and farmer besides. 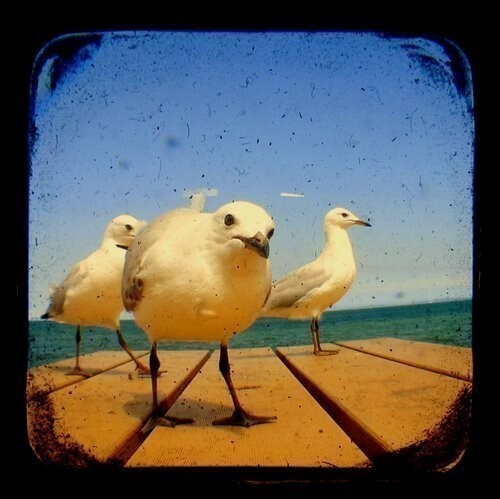 Anyway, Julie featured Tracy's beautiful photography,including this fabulous photo of peering seagulls. When I read the comments at the end, Tasha Chawner,creative jeweller, blogger and avid photographer herself, asked Tracy from Hey Harriet how she managed to photograph these seagulls, and she replied that she bribed them with, yes, of course you guessed it, CHIPS ! So you can understand why I had to share it with you today! Thank you so much to Julie, Tracy and Tasha for allowing me to share. Crisp and golden on the outside, soft andfluffy on the inside, these really are the best ever chips!! Peel potatoes. Cut into long chips about 1.5cm thick. Use a clean tea towel or large piece of paper towel to pat potatoes dry. Pour vegetable oil into a large saucepan, wok or deep-fryer until it is half-full. Heat over medium-high heat until a small piece of potato skin sizzles when dropped into oil. Place a wire rack over a large oven tray lined with paper towels. Divide chips into 3 batches. Cook chips, 1 batch at a time, for 5 minutes or until they just start to colour. Use a slotted spoon to remove to rack. Repeat with remaining 2 batches, allowing oil to reheat in between batches. Preheat oven to 180°C. When all chips have been cooked, allow them to cool for 10 minutes. Reheat oil. Cook chips in batches again, for 7 to 10 minutes each batch or until crisp and golden. Keep warm on rack in oven while cooking remaining chips. Season with salt. Serve immediately. Russet Burbank, Spunta, King Edward, Bintje or Sebago are the best potatoes to use for this recipe. 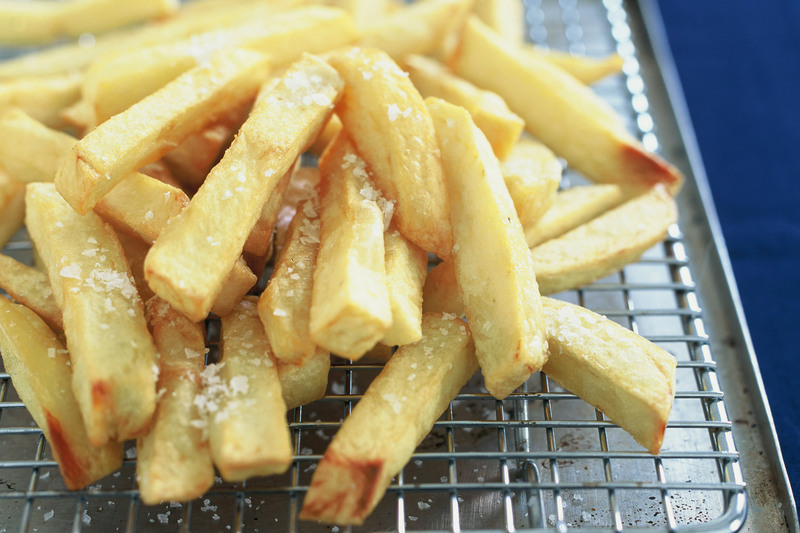 Tip: Chips can be cooked in a metal chip basket (look for these in kitchenware shops). Dip the basket into the hot oil before adding potatoes - this prevents them from sticking to the basket. what you think, and also how you cook your chips!! Oh thanks so much to you too Julie, so glad you like it, and I tell you what, it's so cold here today, I might just be digging out the deep fryer! the chicks are precious and the recipe too. Well I agree, they both look good, and the seagulls are something special aren't they? LOVE it! Thanks so much for including my cheeky seagull photo! Those chips look so good but I don't have a deep fryer. Which is probably a good thing because I'd likely live on deep fried food if I had one! It's just such a fabulous photo Tracy and I am so glad you have it as your avatar (is that the right word?) I know what you mean about the deep fried thing! I would probably be just the same, particularly in winter. These sound good - I love proper home made chips. Ooh me too Rowan! In fact (she says looking at her watch) I think I know what's going to be for tea tonight! I don't have a deep fryer either Jane, so we oven-bake ours - with lots of sea salt, pepper, organic olive oil and a mix of herbs. I'm still yet to tempt a seagull a-la Tracy... maybe next time I'm at the beach. I thought about trying the seagull/chip ploy when I was down in Coffs having fish and chips at the Marina, but didn't want to spare any really! Your oven baked chips sound just the go. These look amazing. I adore a good chip. That photograph is magnificent. I love all the things she did to it to give it more brilliance and to age it. Your trip to Coffs Harbor was wonderful. It would be a win-win for me. I'm one of those very rare and maybe wacky in the head people that love going to the dentist. I feel more relaxed in the dentist's chair than any place other than home ( and sometimes more than home). I think it has to do with the fact that the chair is comfortable, and that I have nothing to do . . .nothing . . . and that is rare. I just lay back and let them do their thing. I've even had to be woke up before, because I fell asleep while the dentist was working on my tooth, and when you fall asleep your jaw relaxes and wants to close. LOL. That's me . . Wacky Me. I am so glad that you took your camera with you and took these photos. It is such a pretty harbor and the beach is so peaceful and breathtaking. You are right, Tracy has a talent for photography. Did you click to see more of her work? Oh Connie, you are the first person I have heard of who actually enjoys going to the dentist! Wacky but wonderful! My son fell asleep once having his hair cut, but the dentist - I don't think so!! Yes, I did go and look at more of her work. She is a very talented gal and you are a sweetie for putting a link to her art and making it so easy to find. Hi Connie, I am having trouble getting to the root of the chip/french fry debate! It seems to go round in circles! I plan a post in the not too distant future to set it straight once and for all, but a bit more chipping away to be done before that!! !